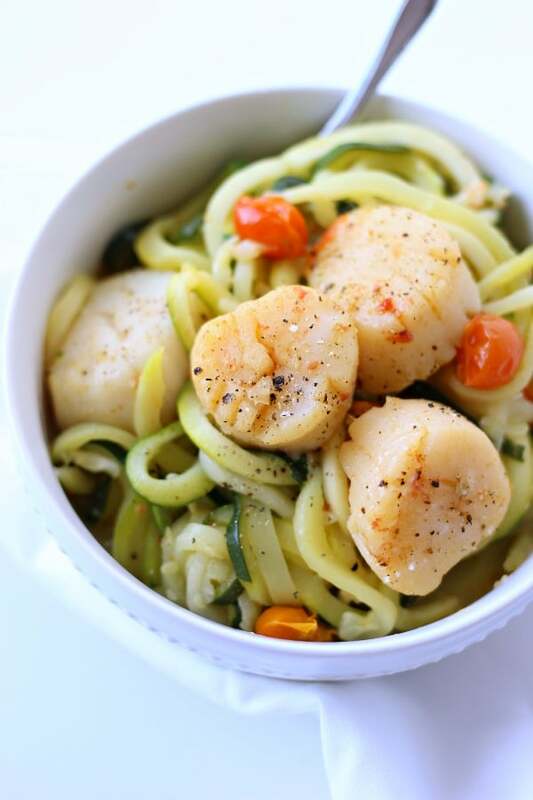 This Scallop Scampi with Zucchini Noodle is an irresistible dish serving up summer’s best flavors. A light, low-calorie yet tasty meal, can be ready in just 25-minutes from start to finish. This dish will undoubtedly be your family’s new favorite! That same day, inundated by a wave of inspiration and pure joy I stopped at my local Whole Foods store and got the ingredients to make my first (of many) zucchini noodles. I made so many other great recipes with my spiralizer, y’all remember the Sweet Potato Twirly Fries, right? It was a big hit, although it left my finger severely wounded 🙁 but in the end sweet potato always saves the day. This summer is all about the zucchini noodles. This low-calorie vegetable makes for a delicious and healthy substitute to pastas and other heavier carb options. It’s really easy and fun to manipulate this versatile vegetable and create many of our favorite dishes, using different sauces and flavorings. What we truly enjoy the most at my house, is a garlic based sauce with fresh cherry tomatoes and cilantro, not overly heavy yet incredibly flavorful. Hellooooo zucchini lovers, this Healthy Low Carb Chicken Zucchini Skillet only takes 30-minutes to make! You gotta try it! When I make this dish I often add shrimp or scallops (or both) for a delicious and easy one-pot meal. Its easy to prepare and full of flavor. 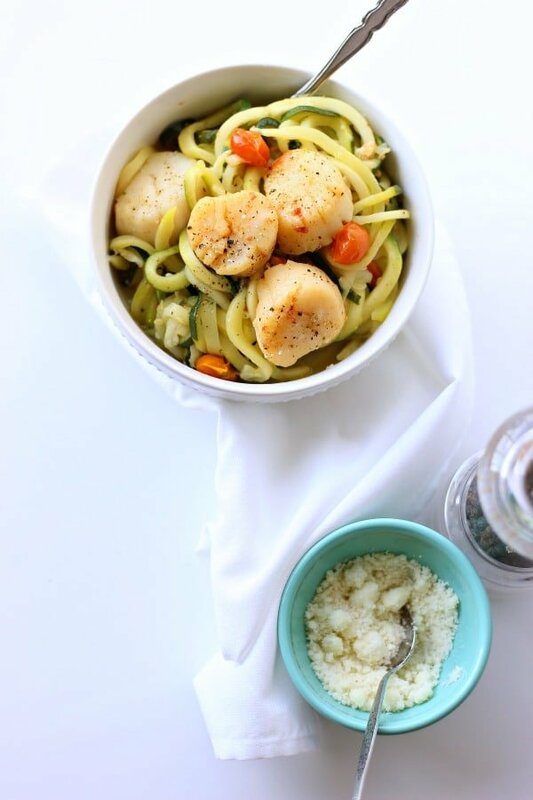 Shrimp scampi is one of my all-time favorite dishes and I love that I can easily substitute the heavier carbs with zucchini noodles, for a lighter, low-calorie and more nutritional meal. By adding the scallops, the meal is complete and absolutely fulfilling. Let’s get to this recipe right away, so you can start enjoying this flavorful summer meal. 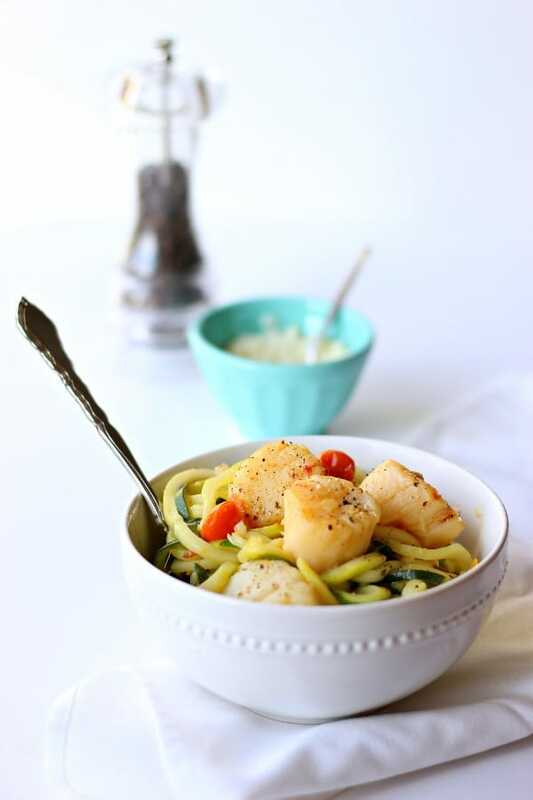 This delicious Scallop Scampi with Zucchini Noodles is an easy one-pot, light and low-calorie dish that you can make in 25-minutes! Heat the oil in a non-stick skillet, add the fresh pressed garlic and cook until fragrant (about 2 minutes). Add the cherry tomatoes (whole) the red onion, thinly sliced and scallops. Sprinkle with salt and pepper to taste and cover if possible. Let it cook for about 12-15 minutes in medium-low heat, turning the scallops half-way through. 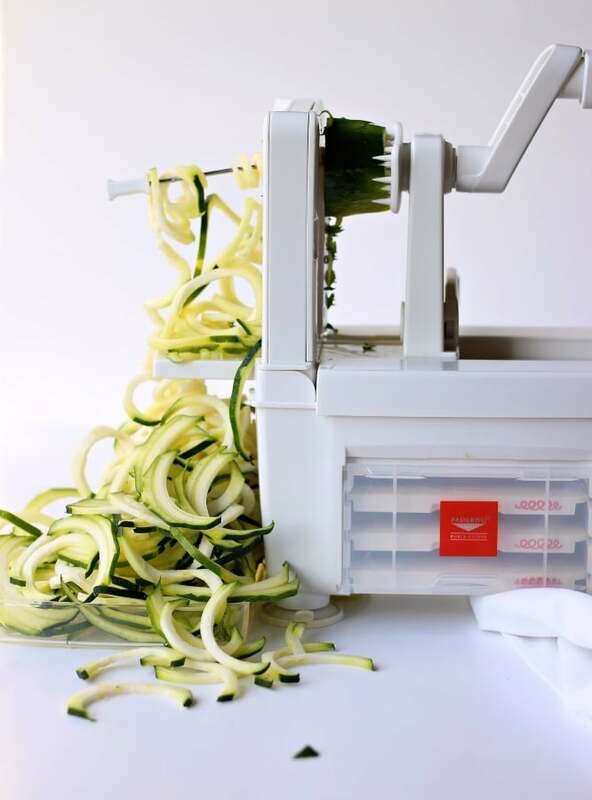 Meanwhile, pass the zucchini through the spiralizer to make the noodles. I leave the skin on. Than transfer the zucchini noodles on a large piece of paper towel and squeeze (or pat dry) to absorb the extra moisture. 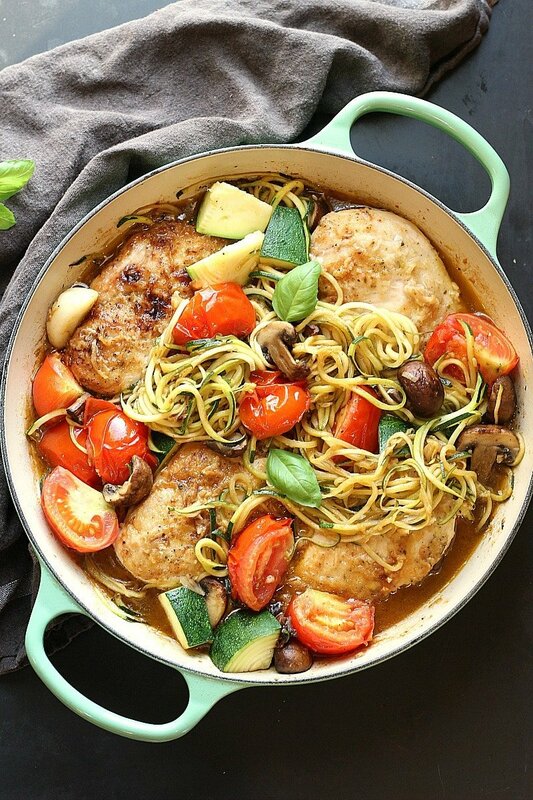 Add the zucchini noodles to the skillet, cover and cook for another 3 minutes. Uncover the skillet and stir the zucchini in with the sauce and scallops. Garnish with cilantro, adjust the salt and pepper if needed. Serve hot. There is no better comfort food than scampi on pasta. Silvia, this looks so fresh and healthy. Wish I had this beautiful dish for lunch today!